We would like to say a MASSIVE thank you to Angela Newman and the team at the Sainsbury's East Filton Store for very kindly supporting Bristol DAWG by allowing a three day charity collection. Sainsbury's were pleased to support "National Pet Month”. Thank you to the customers of Sainsbury's for being sooooooooo generous - we collected an AMAZING £1,179.04. 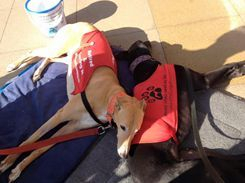 Amber and Charlie making fundraising look such hard work - all the cuddles have exhausted them both!!! Many of you will remember Skip (formerly Skit). Skip came to us at just twelve months old and was with us for a further twelve months!!! He did have some issues, through no fault of his own and we just needed to find him the right home, with the right people. He found his new forever home in Frampton Cotterell with Jan and Keith. Jan is a member of Frampton Cotterell Dog Training so she was just that special person to give Skip what he needed. 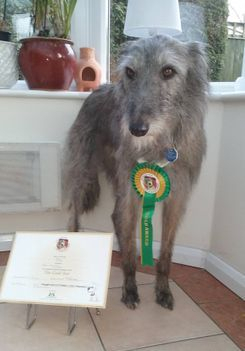 Skip has just achieved his Kennel Club Gold Award and we know how proud Jan is of all she has achieved with him. Well done Jan you have worked so hard with this lovely boy, he is a credit to you, and obviously congratulations to Skip. Not every dog is perfect from day one, but Skip is a shining example of what can be achieved with time, patience and routine. We should like to thank the wonderful ladies at Platinum Pet Care for once again running a photographic competition for us. Entries close on 3 May 2016 and you can find full details here. Gerry enjoyed visiting Portishead yesterday to complete the paperwork making Seeya's adoption official. Five years in a kennel environment, but in just a few weeks she has settled so well with Sue and Richard - thank you both for giving this lovely girl a forever home. Happy to be able to tell you that, after many hitches and glitches, our two new galgos have started on their journey to their new life in England. Our thanks go to Tanya for her hard work in cutting through all the red tape and we're all looking forward to welcoming Figure and Luna to Bristol DAWG. Gerry spent an hour today with Rebecca, Stephen and Gerry, their very handsome lurcher, who are adopting the lovely Triona (now renamed Freya). It's official - the paperwork has been done and Freya now has her forever home - this sweet little girl has landed on all four paws. Thank you for giving her a second chance in life. Big "thank you" to Debbie Martin for fostering her whilst she was waiting for her new home. 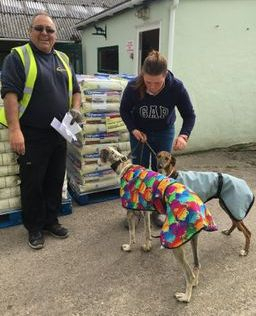 Welcome to our two beautiful new galgos, who arrived at the kennels from Spain today. Keep checking the website, their details will be added shortly. Yet another happy ending for Bristol DAWG as Archie finds his forever home with Sarah and her family, including former dawg Rita and her adopted brother Griff. It turns out that Archie's previous owner is the mother of one of Sarah's friends! It certainly is a small world. Little Sprite (now Leyla) never even made it onto the website! The lucky girl has joined Lou's pack in South Wales along with Gemma, another former Bristol dawg. We wish them luck and a long and happy life together. 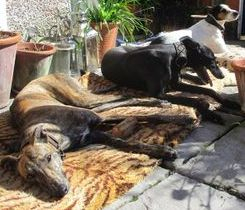 We'd also like to thank Jane, Norman and their pack for fostering Sprite until Lou could take her. We are very, very grateful to Messrs Burgess Pet Care for their generous donation of one hundred and ten bags (count them - one hundred and ten!) of their popular pet greyhound and lurcher complete food. 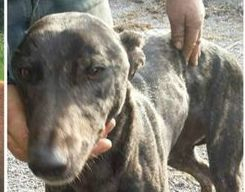 The photograph above shows the delivery driver, who was absolutely overwhelmed to be delivering to a rescue, Kristie, one of the wonderful staff at Tonew kennels, and our latest Spanish Galgos, Figura and Luna. I'm very happy to announce the appointment of a new trustee! Sharon Hunt very kindly agreed to join the Board of Trustees of Bristol DAWG today. I feel sure she will prove to be a great asset to the charity and I also feel sure you would all like to join me in wishing her all the best for the future as a member of the team. This month has been a really good month for rehoming, with Bo being the latest dog to find a forever home. She has landed on all four paws and has gone to live with Caroline and Ian in Weston-in-Gordano. Having spoken to Caroline today, she is amazed at how quickly Bo has settled and hasn't put a paw wrong, she has been such a good girl. Bristol DAWG have to say a big "thank you" to Jess and Andrew for doing an absolutely amazing job fostering Bo and teaching her about the big wide world. Many, many thanks to Vets4Pets, Filton for the wonderful donation of £300 worth of veterinary treatment! 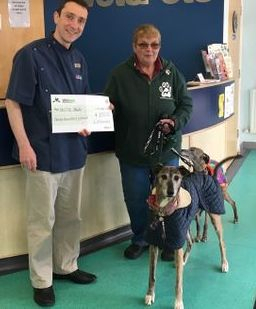 The photograph above shows Poppy and Kookie accepting a cheque from head vet, Michael, with a bit of help from their Mum, Hilary.